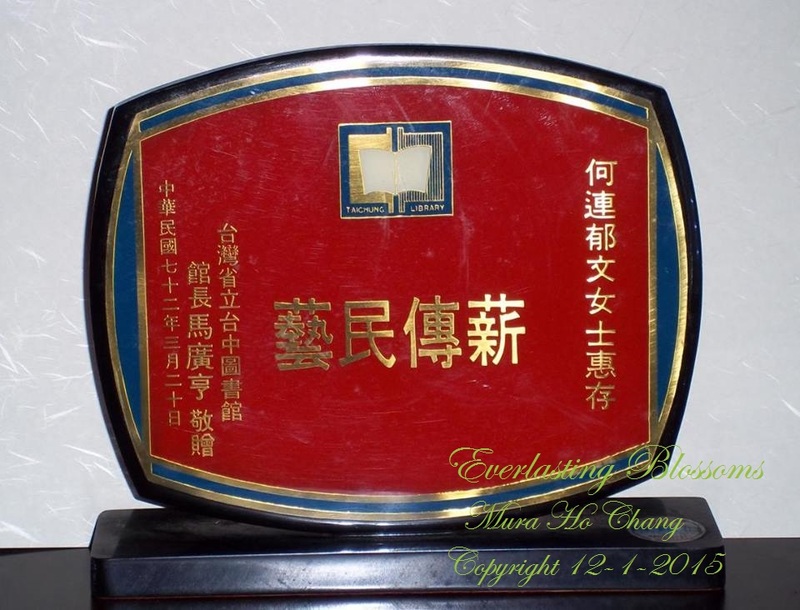 This trophy was presented by Tai-Chung Main Library to Yu Wen to thank Yu Wen’s teaching at the library. This trophy was presented by the students of the crochet class Yu Wen taught at theTai-chung Library. Yu Wen met all kinds of visitors in those nine days. The first exhibition was a remarkable success. The news posted on all papers. Hwa Shr TV stations made three minutes interviewed in their noon news. While the exhibition was on, Kwo Tai Life Insurance offered $3,000,000 NT. 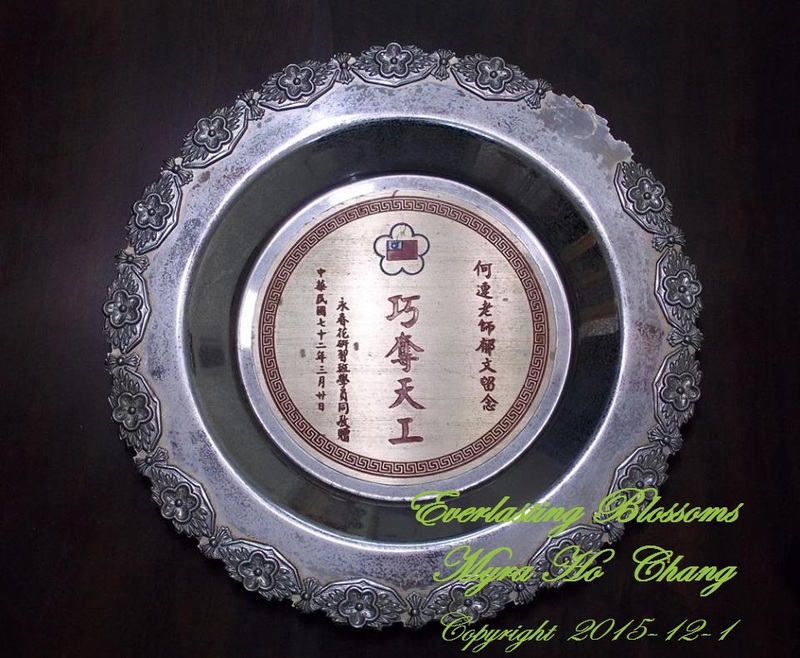 to buy all the Everlasting Blossom. It’s negotiable if Yu Wen was not pleased with the offering, but Yu Wen refused. Many of her friends and relatives felt deeply sorry for her refused such a good fortune. After the exhibition was over, the library asked Yu Wen to open a class to teach people how to crochet Everlasting Blossom. Yu Wen accepted. News spread out. So many people signed up for the class. There were too many signed up for one classroom, so it ended up with two classrooms full for a three month session. Many of them were domestic teachers and art and craft teachers. Yu Wen spent a lot of time in writing the instructions to hand out in classes. The instructions included: “Rose, Dendrobium, peony and poinsettia”. In class, she walked around the room, back and forth between the desks. Explained every question and demonstrated how to work out. The library manager asked Yu Wen to have some more classes. However Dz Yun could tell that Yu Wen was very tired after the session was over. If she kept on having more classes she’ll be exhausted. Nothing would be more valuable than the good health of his wife. He declined the invitation with great courtesy. Yu Wen’s third son-in-law arranged an exhibition in Tai-Nan Library. The mayor of Tai-Nan, Su Nan Cheng cut the ribbon on the Inauguration of exhibition. Mayor Su Nan Cheng came to Yu Wen’s Exhibition in his busy days, it was such an honor for Yu Wen that worth to remember for life. She presented one of her beloved bouquet with vase to Mayor Su to show her appreciation. There were exhibitions held in other cities in Taiwan. Praises and appreciation heard in every one! 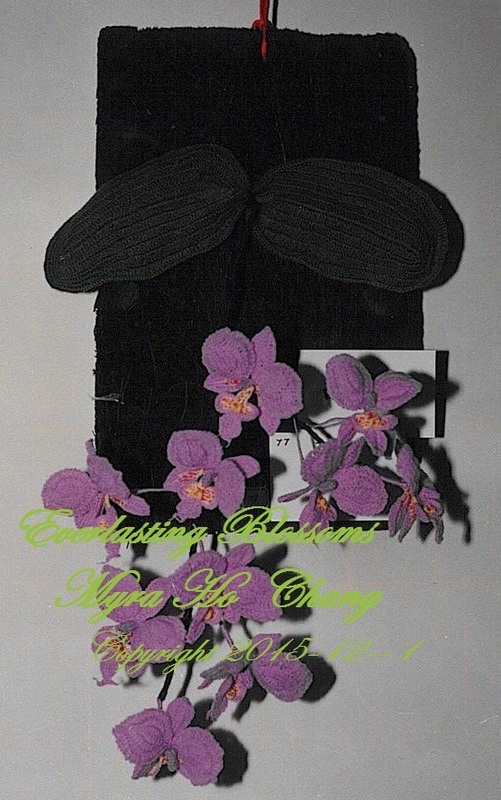 These orchids that my mother crocheted were the most delicate ones. To show the true beauty and it’s unique elegant, she split the yean in two pieces and crocheted with super fine copper wire from an old transformer. Their lifelikeness are breathtaking!